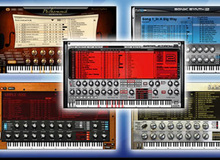 Strezov Sampling has assembled the three volumes of its Thunder virtual percussion sessions for Kontakt into a single bundle, now at reduced price. Best Service introduces Alpine Volksmusik, a sample library dedicated to traditional Austrian, Bavarian and Upper Carniolan folk & brass music. Toontrack's EZDrummer 2 is now available in a new special bundle including extra grooves. Native Instruments today introduced India, the latest in their Discovery Series.